Book — Jeffrey Lieberman M.D. 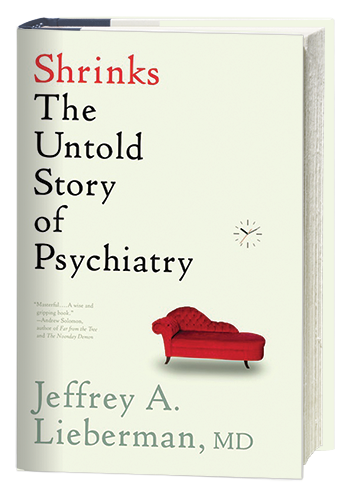 In Shrinks, Jeffrey Lieberman, M.D., shares the story of psychiatry's origins and the checkered history of useless or harmful treatments -- including hydrotherapy, lobotomies, and primal screaming -- to its rehabilitation and transformation into an evidence-based profession. A gripping and illuminating read, Shrinks reveals shocking case studies and serves as an urgent call-to-arms to start treating mental illness as a disease rather than a state of mind. “Shrinks is a must-read. . . A smart, important, accessible book." – Patrick J. Kennedy, former congressman, founder of The Kennedy Forum, and co-founder of One Mind. An intelligent, encouraging survey of the psychiatric industry.